54 Comments	This post may contain affiliate links. 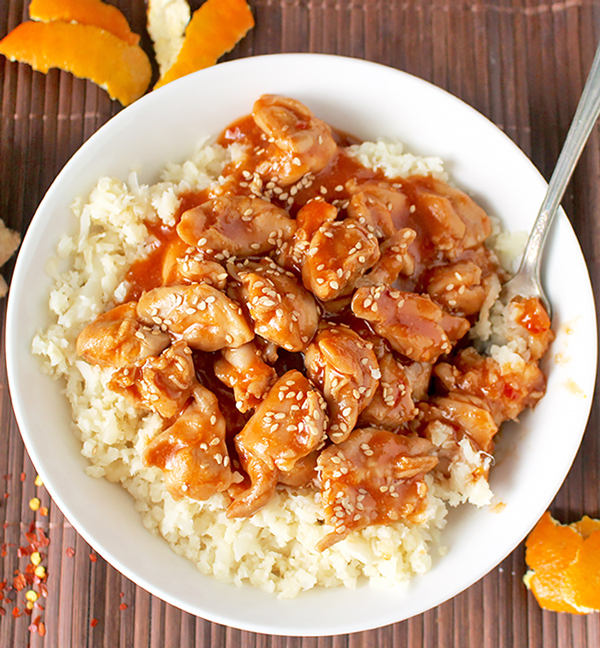 This Paleo Orange Chicken has so much flavor and is made in under 30 minutes! The perfect weeknight meal! Gluten free, dairy free, and lightly sweetened with orange juice. 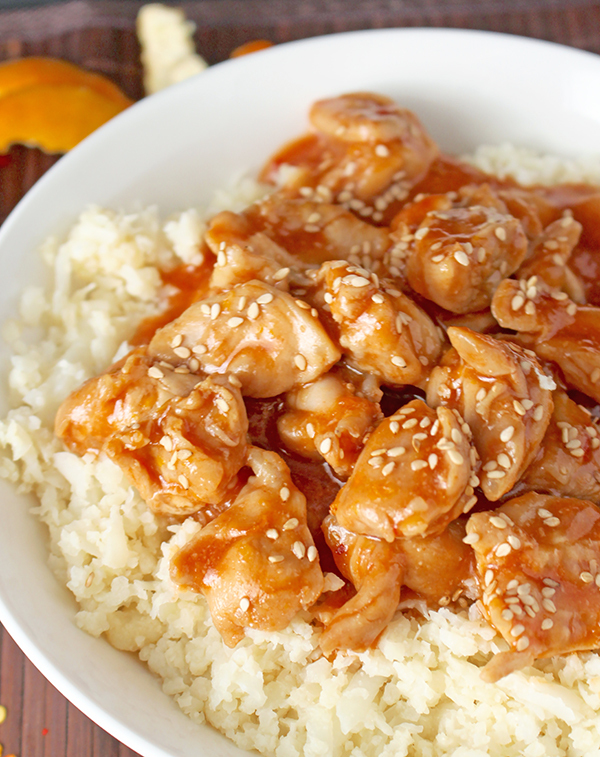 This chicken is mildly sweet, a little spicy, and oh so good! I like using dark meat for this because it is harder to over cook, is more juicy, and is cheap. 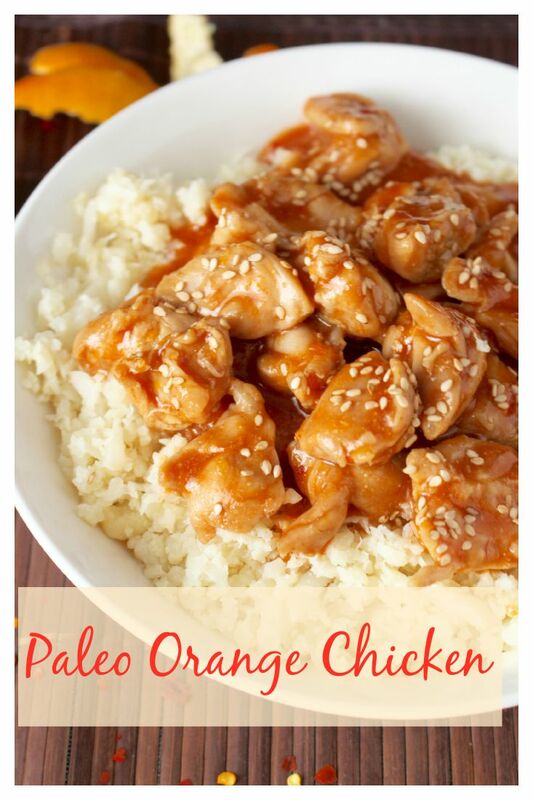 Is this exactly like the mall orange chicken? No, that stuff is loaded with sugar and deep fried! Is this super delicious and so much healthier? YES!! If you’re making it for kids, you may want to leave the red pepper out. On the other hand, if you like spice you can increase the red pepper and give it more of a kick. This meal is not Whole30 because it has honey in it. You can try leaving it out or replacing it with date paste, but I haven’t tried either yet. Although, next time I may try date paste- I think that would work great. The freshness from the orange, the sweetness from the honey, and the spice from the ginger and red pepper all work so well together. 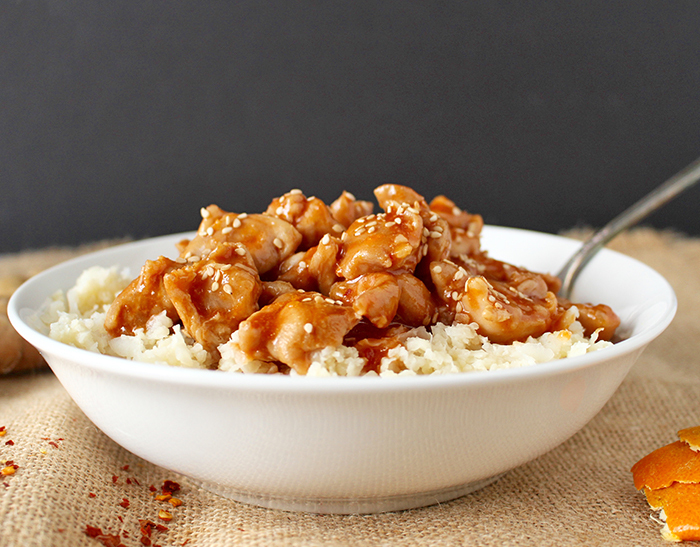 It is fantastic served over cauliflower rice- it makes it feel like the real thing! This is a great quick dinner that you will love! Sprinkle salt on chicken and stir to evenly coat. 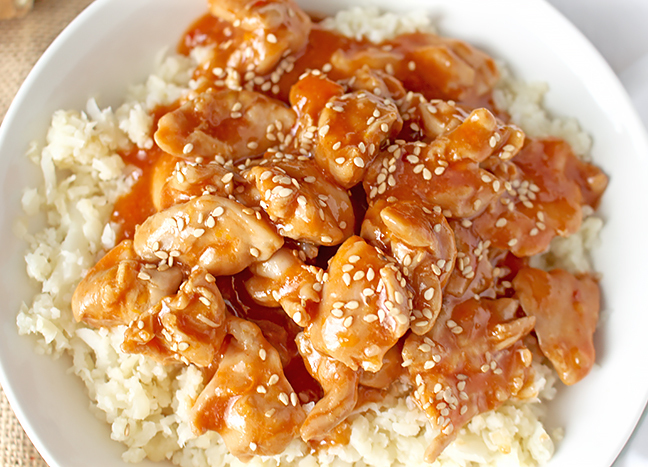 In a large skillet over medium high heat, add the sesame oil and chicken. Cook for about 5 minutes until mostly cooked through. While that is cooking, in a small bowl, combine orange zest and juice, coconut aminos, ginger, tomato paste, honey, red pepper, and garlic powder. Stir as best you can with a spoon. Pour over chicken and stir to evenly coat. Cook for 5-10 minutes or until chicken is fully cooked through. Add tapioca starch if you want the sauce thicker. Stir it in and cook for a couple minutes for it to thicken. Anything you would recommend to replace the sesame oil, tomato paste, & red pepper flakes to make this AIP compliant? Hi Heather- you can use a little fish sauce (1-2 teaspoons) and just leave it all out. I think it will still be delicious!